Whether planting trees to provide a wind break, shade, reduce carbon in the environment, or to beautify your landscape, Safe Electricity reminds everyone of the importance of planting tall-growing trees safely away from power lines. Trees that grow too close to electric lines can create shock and fire hazards and power outages. Trees and wood conduct electricity, causing outages or momentary interruptions when branches touch overhead lines. Electrical arcing and sparking from a wire to a nearby branch also can cause fires. Safe Electricity urges parents and caregivers to teach children never climb trees near power lines. Accidental contact of electric wires with a tree limb while climbing or playing around the tree can be fatal. Landowners must understand utility line tree trimming and clearance practices, and why they’re important to safe and reliable electric service. If you have trees that appear to be growing into power lines, contact your electric utility. Never try to prune them yourself. Utilities have or can recommend skilled professionals trained to prune and trim trees for electric line clearance safely. Seek help in choosing and placing trees that provide shade, color, and screening that won’t grow to interfere with the electric supply. When landscaping, take the time to research tree selections by consulting your local arborist, tree nursery, or utility – experts who can assist in designing a beautiful, shade-filled yard with trees appropriate for each area. Consider mature height of trees. Never plant a tree that could grow to 25 feet or more near a power line. Tall growing trees should be planted at least 20 feet away from power lines and 50 feet away to avoid future pruning. A mature height of less than 15 feet is recommended for trees planted near power lines. Do not plant near underground utility services. Tree roots can grow to interfere with underground pipes, cables, and wires. Future repairs to these facilities also could damage the health and beauty of nearby plants and trees. 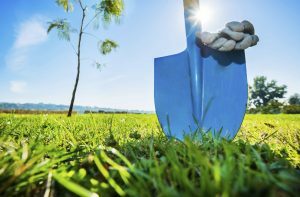 Before digging, call the local underground utility locator service to mark location of underground utilities, so accidental contact, damage, and injuries can be avoided. There are many beautiful varieties of trees, low-growing trees and shrubs that provide color, screening and shade, and enhance the quality of life in our communities and environment. Consider the types of trees that co-exist well with power lines and the environment to avoid the need for trimming for line clearance.